NOTE: the times as listed below are approximate only and will likely change based on paddling conditions, early/late departures, group skill levels etc. Please bear this in mind. The flotilla will depart at 7:30 am sharp on Friday July 22 from Dolphin Dock, next to the Swartz Bay Ferry Terminal in North Saanich, BC. Please arrive at least one hour early to check-in, unload and park your vehicle, load your boat and participate in a final paddling-day briefing (beginning at 7:00 am sharp). From Victoria, take Highway 17 (Patricia Bay Highway) toward the Swartz Bay Ferry Terminal. This drive is 32 Km and will take ~ 30 minutes. Follow the signs for Land’s End and Passenger Pick-Up/Drop-Off, exiting the highway on the right. At the end of the off-ramp, go straight (middle lane), you will now be on Dolphin Road paralleling the ferry terminal. The road will curve to the right. Take a left onto Barnacle Road immediately after the Seaspan terminal entrance and a fenced-in adjacent property. Barnacle Road is a dead-end at a Government dock. There is very limited space on Barnacle Road so loading and unloading must be efficient. There is also VERY limited parking on Barnacle Road, please plan on parking in the BC Ferries Long-Term parking lot and walking back. This lot is ~900 Metres from Dolphin Dock. Long-Term Parking Fees are $12.00/day at the ferry terminal: http://www.bcferries.com/at_the_terminal/parking/. 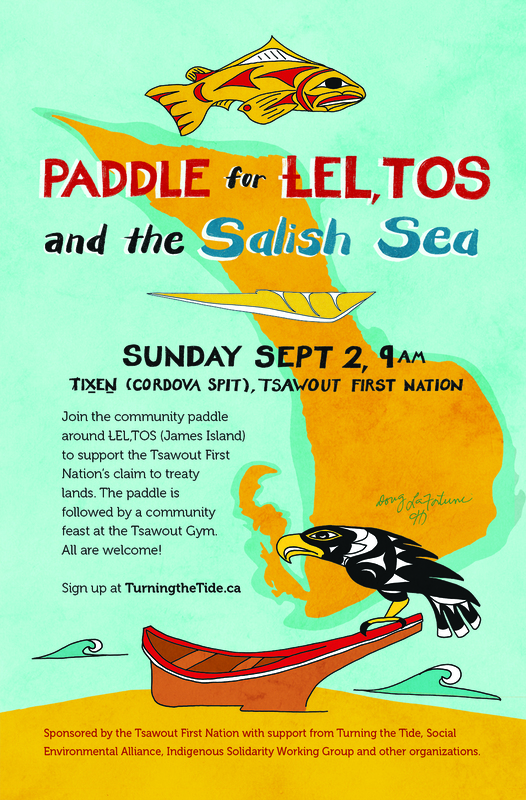 If you plan on joining the flotilla from one of the Gulf Islands, please contact us to arrange rendez-vous details: http://www.TurningtheTide.ca.